Week 13 complete – phew! Yesterday I completed week 13 of my training for the London Marathon by doing my longest run ever of 19 miles. It felt like a massive achivement, not just in that I completed that distance but in that I felt that I could have kept going at the end. A massive confidence boost with just 5 weeks to go before the big day. But, I need to be honest and tell you something….I will be quite pleased once this training is over and the day itself is here. I think I’ve got to the point where I know I’m going to make it around one way or another and I’m getting a bit tired of running, thinking about running, stretching after running, eating before and after running, feeling tired from the running and planning what I’m going to wear when I’m running. Don’t get me wrong, I still love running and the way it makes me feel but right now I feel like my body and my brain have been taken over by training for the marathon. I will be very happy to get back to running because I want to, not because a plan says I should. So with that off my chest, back to last week. It was a funny week in that I’d done my long run from the week before on the Monday, as we’d been away. I also had to travel with work on Tuesday and Wednesday which always makes things that bit more difficult. I planned to go to my usual Tuesday night run with the ladies of Boutique Running Club but come Tuesday afternoon I felt so tired from Monday that I decided my body needed rest much more than it needed a relatively quick 4 mile run. I saw it looking at me and had an inkling about what was going to happen next and sure enough as I ran past it started running after me. It caught up with me really quickly at which point I squealed like a girl and it’s owner finally realised what was going on and shouted at the dog which backed off straight away. I’m sure it was just being curious but it’s safe to say I didn’t enjoy the experience! On Thursday morning I got up early and did a quick intervals session – my legs still felt quite tired so again I didn’t do the mileage as stated in my plan. 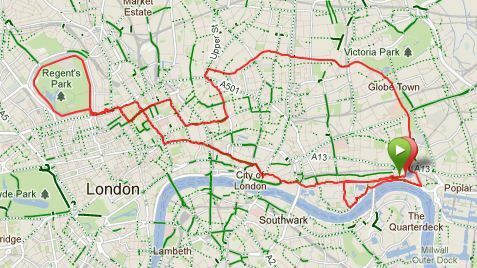 On Friday lunchtime I fitted in another 4 miles – just to keep my legs ticking over before the ‘big one’ on Sunday. On Saturday I went to a 2hr Yoga for Runners workshop at http://www.goodvibesfitness.co.uk/. It was a brilliant session that I really enjoyed and learned a lot from. We started by looking at some joint mobilising movements that can be done before a run and then at some key post run stretches. Some of these were completely new to me and are things that I will definitely add into my stretching repertoire from now on. We moved through some yoga poses which are particularly good for runners, poses that strengthen and stretch hamstrings, hip flexors, glutes and quads. My particular favourite was pigeon which provides a fantastic stretch for the hip flexors and glutes! We ended the class with some relaxation and visualisation techniques which I could see could really help before and during a race. The teacher also shared tips on nutrition and hydration and I felt the class feeling stretched, strengthened and more knowledgable – not bad for a 2 hr class. It’s fair to say that for most of the week I have been thinking about the long run. It was scheduled to be 18 miles, the second longest distance in the plan. My longest run previous to this had been 16 miles and I had struggled from about 10 miles on and pretty much walked the last few miles,so I was quite concerned about how this was going to be. I’d mapped out my route, added some 1990s rock tracks to my running playlist, had a very sensible Saturday night with a carb laden dinner and gone to bed at a reasonable time. Full marks for preparation. On Sunday morning I woke up at 7am, made my porridge and banana, ate it and then went back to bed for an hour or so while it went down. By 9.30am I was dressed and prepared and ready to run. Mentally I was feeling pretty good, I can never tell how I’m going to be physically until I get going. I set off feeling OK but quickly realised that it was going to be one of those days when the first few miles feel really hard. By mile 4 I was seriously wondering whether I would make it to 10 miles, let alone 18. I had an energy gel – a Powerbar gel with caffeine (which are now rivalling High 5s as my favourite), and suddenly things clicked into place. The next few miles felt relatively easy and before I knew it I was over 10 miles. By this point I was walking for around 2 minutes every 10 and sometimes a bit more. I have realised that I am not going to be able to do my 9 and 1 routine for the whole of the marathon and that 8 and 2 becomes a lot more comfortable after about 9-10 miles. For me, the marathon has always been about getting around with a smile on my face, enjoying the experience. If that means I have to walk a bit more then so be it. By 14 miles I was heading for home and feeling pretty good. My legs were a bit tired but nothing like they had been on my 16 miler and I was able to run for a bit more of each mile. Some of my 1990s rock tunes chose to play themselves at great points on the route – I never imagined I’d run past St Paul’s cathedral listening to Enter Sandman or past the Tower of London with Killing in the Name of ringing in my ears! By the time my Garmin ticked over to 18 miles I realised that I was still a mile from home and feeling good. I decided to keep going and decided that I would run the whole of the last mile. And so I did. The amazing thing was that as the Garmin showed 19 miles I felt that I could have kept going. It was a fantastic feeling. At the start of this training I had trouble visualising how far 16 or 18 or 19 miles was. This map of my run shows exactly how far 19 miles will take you – I love how far out it is zoomed to be able to fit it on the page! Today I have been to see my osteopath for a regular ‘maintenance’ check and am delighted that despite running 19 miles yesterday I have no significant issues. My recovery routine, yoga and stretching are obviously working well for me and giving me the best possible chance of getting to that starting line in good shape. The starting line which is now less than 5 weeks away! I’m raising money for a great little East London charity and would really appreciate your support – if you are able to help me towards my fundraising target that would be fantastic – you can donate securely online by following this link http://www.justgiving.com/Rebecca-Jones12 Thank you! Previous Week 12 complete – two thirds through! Sounds like we've all reached a similar place at the same time. Amusing isn't it? Well done on the long run. Nice to have that under your belt! I'm a little jealous!